Doc Holliday is modeling an IQLeather Dog Collar with attached Leash. Handcrafted dog collars, you ask? What’s wrong with that $2.00 dog collar I picked up from the dollar store? There are plenty of excuses to avoid collars, some of them are valid and others, not so much. For Shih Tzu dogs that never leave the house, never go outside, never take a walk, and never sees the light of day, you are right, a collar may not be necessary. But for the average Shih Tzu, who takes a walk, runs errands with their owners, enjoys a picnic in the park or an extended weekend in a campground, a collar is not a luxury, it is a necessity. Harnesses are excellent for walks. They allow the dog to walk comfortably on a leash without the threat of putting undue pressure on the trachea and make the outing more pleasant for a brachycephalic dog. They are, without a doubt, the best choice when walking your dog on a leash. But they have one limitation. They can not hold tags. I recently counted my dog’s tags: One Rabies Tag, One AKC / Microchip Tag, One County License Tag—That’s a lot of tags! That does not even count the identification tags that I plan to purchase shortly. Depending on your location, you may need all of these tags to remain “legal” when your dog is out and about. Moreover, if the unthinkable happens and you get separated from your fur baby, those tags could get your dog returned quickly and easily. Microchips are also crucial, but the average dog owner does not have a chip reader so your dog would need to go to a veterinary hospital or shelter so that someone could “read” the number and initiate the process of returning your dog to you. So don’t assume your dog can go without a collar and tags. I have seen how fast a little mischievous Shih Tzu can slip out the door and be down the road in a wink of an eye. Now that we have established the need for a collar, what kind is best. Collars are made of a variety of materials with nylon, polyester, and metal being the most common. Collars made out of leather are also a very popular choice. Traditionally styled collars come in a variety of colors, widths and styles. Some come with a traditional metal buckle, but the majority of them are made with plastic snap closures. They should fit snug but not tight around your dog’s neck. You should be able to fit two of your fingers comfortably under the collar to assure that it is not too tight. Halter type dog collars are very popular with larger breeds and even small breed dogs. 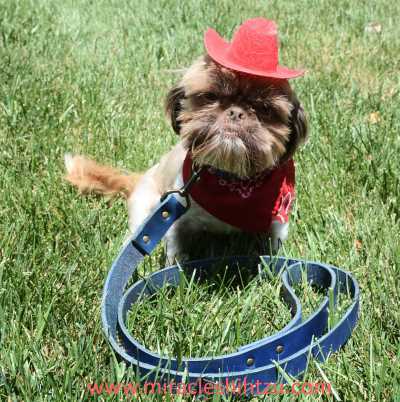 Shih Tzu and other flat-faced dogs have a hard time with this style of collar. You might see them called head collars and they look almost like a horses’ halter to me. Halter type collars are designed so that one band goes around the back of the head and another one on the nose. So you see, if the dog does not have a well-defined nose, it is hard to imagine how this collar would work. People who use these are very satisfied with the control they have over the dog. They are not a muzzle as some people might think. Slip or Choke collars may be needed for very strong-willed dogs. They are often used in some training circles to keep dogs under control. 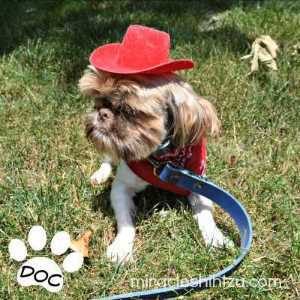 They can be very dangerous to Shih Tzu dogs who may be prone to tracheal collapse, so are not advised. This method of dog training is “very old-school” and may cause more harm than good. One exception is the show lead. These are the type of collars used by handlers who are showing their dog in conformation events. I have a couple of these, and I use them after the dog is trained to walk on the leash. Using them to teach the dog usually ends up causing the dog to choke, cough, and gag. Never allow a dog to wear one of these in a crate or cage for fear of choking. Remember that Shih Tzu dogs have delicate tracheas and you do not want to put pressure on this sensitive area for fear of doing internal damage. Pronged Collars are only used for large breeds that pull or tug on the leash and should only be employed by an experienced person in a training situation. This is like the last resort collar when none other will work to train a dog to walk nicely on a leash. Again, I would strongly discourage anyone from using one of these on a Shih Tzu dog. The vast majority of collars are manufactured in mass quantities, so there is little wiggle room for getting something unique. While there are plenty of hand-made, one of a kind sites that you can visit to find a unique handcrafted dog item, I wanted to tell you about one that I recently found. Angie Quintero is the owner, founder, and leather artisan behind the company iQLeatherDogCollars.com and she is assisted and inspired by her three special German Shepherds, Sawyer, Pixie, and Nala. We chose a blue leather collar with matching leather crafted flower along with a matching blue leash. You can also choose any collar with or without the flower. The XXS size fit all of my dogs, adults, and puppies, except one dog. Poor Helda, the (slightly overweight) Bulldog could not fit into the XXS size. This is Doc Holliday. He wanted me to tell you that he loves the leather collar and leash, but wishes I would purchase a more appropriate hat for him. Red is definitely too flamboyant and girlie for his tastes. Working out of her studio in western Oklahoma (U.S.A.) she produces high quality leather handcrafted dog collars and leashes in a variety of colors and sizes, from XXS to XXXL. As I mentioned above, all of my Shih Tzu dogs, it into the XXS size, from my youngest Poppy to my oldest, Zoey. I especially appreciate how these collars are created. Made from 100% vegetable tanned leather and secured with top quality brass hardware, these products are meant to last a lifetime. Angie backs up her creations with a Buy it for Life Guarantee. It has been a very long time since I found a product that could last a lifetime, even if it is measured in dog years. The collars run about $44 – $64 USD and you can elect to add a matching 4 foot leash for $50.00. When you add up the costs of dog collars over the life of your pet, you are going to find that this is a real bargain! If you do purchase one of Angie’s handcrafted dog collars, you will want to be sure to keep it looking it’s best. Here is a rundown on cleaning options. If your dog decides to roll in the mud or get the collar especially dirty, you will first want to wipe off any grime or dirt with a dry cloth or paper towel. Next, use a warm damp rag wrung out well to wipe down the collar. Lay it flat and let dry naturally or you can use a fan if you need it to dry quickly. Stay away from harsh soaps but you can use a dish or hand soap if necessary.